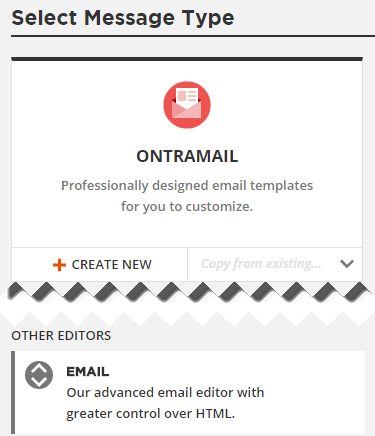 ONTRAPORT offers a number of ways to keep your customers engaged using email. This article covers the basics of automatic and manual sending of emails. Automatic sends can follow up with every contact. Powerful segmentation with Campaigns allows to you send the right messages via the right channels at the right time. Examples include but are not limited to, after form fill outs, web page visits, product is purchases (or not purchased), after Tasks are completed or upon link clicks. 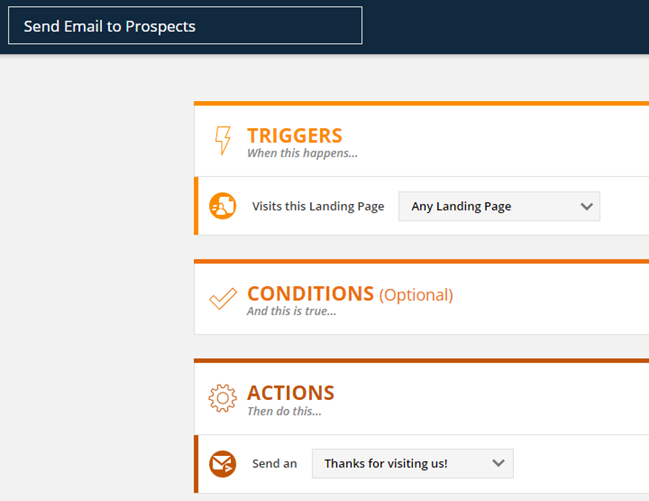 You can easily create sophisticated Campaigns to automate everything from lead follow-up and order fulfillment to task management and even internal business processes. Manual sends are used by many entrepreneurs who want to send one-off messages. 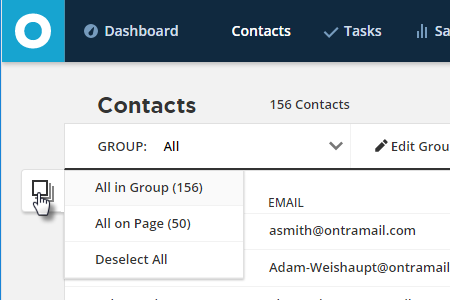 Select one, all or a Group of contacts in the Contacts Database, or a segment of contacts from a Campaign Map that meet certain criteria and quickly schedule an "email blast" (a.k.a, broadcast). Broadcasts can be scheduled for immediate sending or at any time in the future. In the Settings panel, select the email message you wish to send using the dropdown menu under the Send Contacts This Email section. 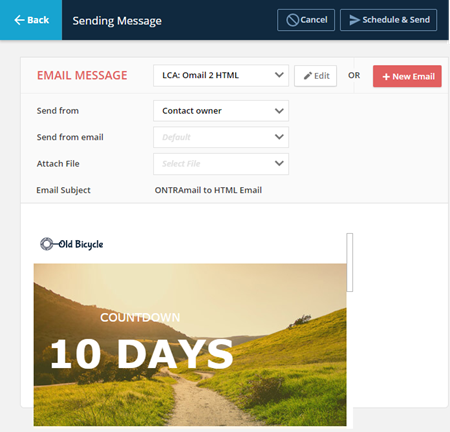 If you wish to send the email later, add a Wait filter element before the email element. Now anyone who is subscribed to this Campaign will receive the email when it is scheduled to be sent. Select your Contact or Contacts to receive the email. Go to the Contacts collection. Select a contact or multiple contacts by checking the box to the left of their name. Hover over the group selector and choose "All in Group" or "All on Page"
Click the Email icon in the Action bar. The Send Email dialog appears. Select an existing message from the drop down, or create a new email by clicking the +New Email button. If you select an existing message and are not going to edit it, you can skip to step 10. When creating a new email, the Select Message Type dialog appears to allow you to select the email editor. Select the message type and the corresponding message editor will load. If you clicked the Edit button to edit an existing message you selected from the dropdown you will be taken to the email editor for that message. After creating or editing the message, click the Send button at the top right. You will be returned to the Contacts Collection. The Schedule Send dialog will appear. 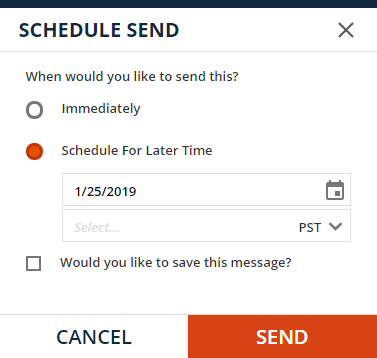 You can send the message immediately or schedule a date and time in the future for it to be sent. If you have edited the message or created a new one you will see the checkbox asking "Would you like to save this message?". Checking this box saves the message in the Messages Collection. An email you send without saving will only appear in the contact's Contact History tab, and will not be saved in the Messages library. It will not appear in statistics for email opens, clicks, etc. When you are finished selecting options in the Schedule Send dialog, click Send. Q: If i create an email broadcast and schedule it to go out to a group in the future, are contacts that are added to this group in the meantime included in the list of recipients for that future email? A: No. The email is queued only to contacts who satisfied the requirement when the email was scheduled (contacts who were in the group at the time the email broadcast was scheduled). So if you do a group broadcast to "all in group" for the email to fire next week, the email will not be sent to contacts who were added to that group between the time the email was scheduled and the time the email was delivered. If you see this becoming an issue for you, you can instead create a Campaign, subscribe all contacts you wish to receive your email to the Campaign, and add the email to the Campaign as an email action step and add a Wait element to fire precisely when you want it to. This way anyone you subscribe to the Campaign up until the very moment the email step fires (sends the email) will receive the email. Q. 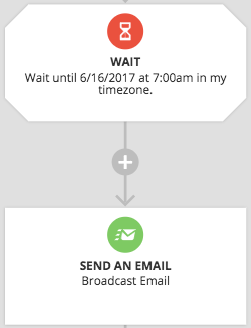 Does ONTRAPORT use the time zone setting of the account to determine when to send broadcast email? A: No. ONTRAPORT uses geolocation to adjust the time display to the local time of the computer you log in with, and it is this time that is used to schedule the broadcast. This avoids having to do "clock math" to adjust for different time zones. When scheduling a broadcast, think of the local time you want the broadcast to send and use that. Q. I sent myself an email and opened it but ONTRAPORT isn't showing an open. Why not? A. The industry standard for checking email opens involves injecting a tiny 1x1 transparent pixel into your message. Attached to that pixel is a unique URL - so if you open the email and display images our system can see that you've downloaded the image and we can safely assume the email has been opened. However, if a user opens the email and doesn't display images, the pixel will never be downloaded and we won't know the message has been opened. Because of this we can only track emails with roughly 75% accuracy. Now anyone who is subscribed to this sequence will receive the email when it is scheduled to be sent.